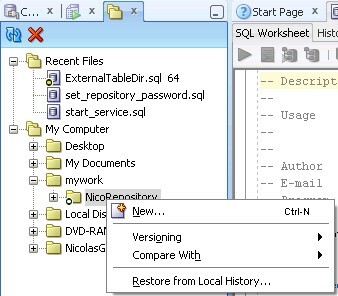 To connect to your repository (Step 2) you'll need to use HTTPS, followed by the local IP address of the computer (your computer in this case) Visual SVN is hosted on, followed by /svn/NameOfYourRepository.... If that does not work, you can try to use the SVN command line tools, e.g. svn commit, to synchronize your local project with the SVN repository (and check it out anew using Eclipse). In case the SVN command line tools do not work, there might to be an actual problem with the SVN files. If you connect into the server and run the same script does it work? Does the server have connectivity to the other server where the SVN repository is located? This time, use the -u option, which causes svn to actually contact the repository and ask it for more information, rather than merely inspecting your local copy of the files. Note that svn status without the -u option reveals no changes, because we haven't worked on our local copy in the meantime. You need to determine whether this is a problem with TortoiseSVN, your Subversion repository, or your network connection. First of all, check your URL.